Triumph Tiger Celebrates a Record Low! For the short statured amongst us, who may have considered the excitement surrounding adventure touring out of reach, Triumph have announced the addition of two new models greatly improve the accessibility of your next big adventure! 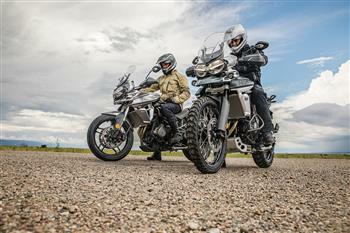 Triumph's popular Tiger 1050 SE sports-tourer has been reduced to just $15,990 rideaway at participating dealers. Triumph Australia has just announced free factory panniers with every Alloy wheeled Tiger Explorer sold! "This equates to about $1100 of added value to the Explorer" commented Triumph Australia's Mal Jarrett. Aluminium rimmed, steel spoked wheels with tubeless tyres. Ride by wire, traction control, cruise control and switchable ABS all as standard. Triumph Announces Tiger 1050 SE! Triumph Australia has just announced that it will be releasing its Tiger 1050 in 'SE' guise, and running out the current Tiger 1050 at an incredible MLP of $13990 plus ORC 'including panniers'. 2018 Triumph Tiger 800 range.